Start your America Holidays departing the UK on your chosen scheduled flight to Los Angeles. 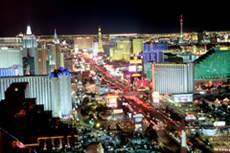 Upon arrival collect your rental car and proceed to your chosen hotel . Take the day to explore the many sights and scenes of Los Angeles area, Beverly Hills, Hollywood, Malibu or Marina del ray the list is endless. Yosemite National Park, best known for its waterfalls, but within its nearly 1,200 square miles, you can find deep valleys, grand meadows, ancient giant sequoias, a vast wilderness area. Park rangers are on hand to assist you in planning hikes and cycle routes or simply follow one of the trails to mirror lake, careful of the bears, and experience the true beauty of Yosemite. On the surface this looks like a long days driving but the scenery is breath taking. Start the day with in Yosemite National Park making you way up and over Tioga Pass ( May to November only) and down past Mammoth Lakes and Lone Pine before the land scape changes dramatically from the lush vegetation on Yosemite into the red rock and barren landscape of Death Valley. This amazing one horse town is like stepping back in time to an American Western and a must see. An early departure will take you via the shores of Lake Mead to Zion National Park and up to Bryce Canyon for the next two nights. Bryce Canyon is known for its spectacular hoodoos, fiery colours, and endless vistas, but when the sun sets upon the canyon another impressive scene takes the stage. Bryce Canyon has some of the darkest and starriest night skies in the country, boasting clear mountain air and a location far from city lights and other light pollution. 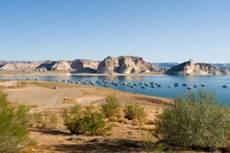 Having marvelled at the splendour of Zion and Bryce it’s now time to admire the spectacle of Lake Powell, a stunning destination, the second largest reservoir in North America, is 186 miles long with 1,960 miles of shoreline. Hundreds of side canyons, inlets and coves shelter Indian ruins and natural wonders that make Lake Powell a paradise for house-boating, photography, and general exploring. It’s a must to start or end one of your days here on a boat trip across the lake. This morning you drive to the Grand Canyon for a spectacular landscape and breath taking views, drive along the south rim stopping at look out points including Hermits Rest & Desert View heading for the Grand Canyon Village and your hotel for the night. We suggest an early start as The Grand Canyon is vast and there is so much to see. Enjoy a mule or bike ride down into the Canyon or take a helicopter flight giving you a birds eye view of this vast area and the Havasupali falls on the west rim. After watching the sunrise over the Grand Canyon drive south through the traditional and olde-worlde town of “Williams “ then down through Oak Creek Canyon and Sedona to the valley of the sun, Scottsdale Arizona for a little luxury, enjoy a round or golf, or relax in the spa or by the pool surrounded by the stunning Camelback mountain. Bring your America Fly Drive Holidays to conclusion with some last minute shopping, sightseeing or relaxing before you reluctantly return your rental car and check in for your overnight flight back to the UK from Phoenix direct to London Heathrow.